On July 29th, while the nation was digesting Hillary Clinton’s acceptance of the democratic nomination for President, President Obama quietly signed S.764, the first national GMO labeling bill, into law. The bill was signed with no fanfare and little National press. Seemingly the answer to anti-GMO activists’ prayers, the bill mandates that companies disclose whether their food products contain genetically modified organisms—or does it? In a recent New York Times Op Ed entitled “Genetically Engineered Food for All,” Nina Fedoroff made a novel argument: The manifold virtues of genetically engineered food, she claimed, remain unrealised because of excessive regulation. The US government is stifling innovation by an over-cautious approach to this benevolent, life-sustaining technology. Contrary to the assertion by Nina Fedoroff (Aug 19 Op Ed) that the US has a “regulatory thicket” which is “slowing down the development” of GE crops, the government has essentially abandoned what little oversight it did exercise. Our procedures fall far short of those recommended by international agencies such as the treaty governing the movement of GE organisms across international borders and the UN guidelines for scientific assessment of GE food risks. To avoid drawing the public’s attention to GE and its risks, the government decided in 1986 against Congressional consideration of a special GE regulatory statute. Instead it announced that existing laws would be stretched to cover these new products. The result has been the deployment of illogical legal pretence to “cover” vastly novel products (like engineered fish). Further, the set up provides few opportunities for public information and oversight. In 1992 the FDA announced it would not regulate GE foods, claiming (without evidence and over the opposition of its own scientists) that they were “substantially equivalent” to regular ones; subsequently, this view has been rejected by international authorities. Meanwhile the Agriculture Department has refused to do any environmental assessments of GE crops, despite mounting scientific and empirical evidence of contamination and harm to biodiversity. In recent years, court lawsuits forced it to do several such examinations, but these have been inadequate by international standards. Thus, the “safety” of GE is far from proven. Risk research is barely funded; rather “don’t look, don’t find” has been the US posture. The absence of evidence of GE risks is, therefore, not evidence of the absence of risk or that GE crops are safe. The past few decades have witnessed changing agricultural labor dynamics in the Global South. Beginning in the 1980s, during an era of giddy faith in Reganomics, international lending agencies and western governments began pressuring and cajoling many African nations into structural adjustment programs. 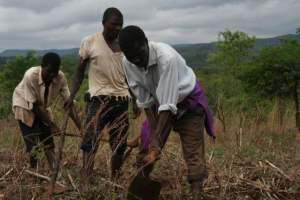 These programs, aimed to foster agricultural development and economic growth, were predicated on a certain model of agriculture, certain hallowed criteria: African agriculture must follow the path of the United States and other developed nations; it must be rationalized, industrialized, and the state’s apron strings must be cut (shameless hypocrisy in the face of massive production and export subsidies for farmers in the U.S. and Europe).The result was the promotion of large-scale, market-oriented, chemical-dependent, and capital-intensive agriculture and the denigration of subsistence farming. In many areas this forced rural farming communities to adapt their livelihoods and become more ‘flexible’ with their labor. Although the consequences of the first Green Revolution and structural adjustment have taken different forms in different parts of Africa, in general farmers and laborers have been uprooted and forced into labor mobility. No longer able to survive in one place, these people must migrate, traveling to cities during the off-season for additional income or hired temporarily by contractors to work on large farms just so that they can hold onto their own land, homes, and sense of place. This phenomenon has been termed ‘footloose farming’ because, under the pressures mentioned above, farming—traditionally a livelihood intimately bound to a patch of earth, literally grounded in the soil—requires migration. For the most part it is men who migrate, unencumbered with child-care and ‘free’ to roam. It is a double-edged sword, for although migration can be relatively lucrative, it leaves whole villages without men and destabilizes rural communities. Furthermore, large, capitalist farming enterprises benefit from this situation as a migratory workforce faces greater obstacles in resisting exploitation; it lacks the time, social networks, and leadership required to muster the collective bargaining power to improve labor conditions. One can argue that this socially destructive phenomenon of footloose farmers is not just an unfortunate side effect of western-imposed agricultural change in Africa (and indeed many other parts of the Global South), but a core piece of a dominant development ideology that devalues food sovereignty and community cohesion, tossing these aside for the sake of blind inequitable growth. The forces that lead to footloose farming and land mobility are threats to the larger question of food sovereignty. Defined by La Via Campesina, a global movement of peasant farmers, as ‘the right of peoples to healthy and culturally appropriate food produced through sustainable methods and their right to define their own food and agriculture systems,’ food sovereignty stands in opposition to AGRA and other high-tech, foreign-imposed approaches to farming. It stands in opposition to a form of inequitable and short-sighted ‘growth’ that cleaves farmers from fields, people from place.